If you can send me photos to show what your WHOLE piano looks like on the outside, unobscured by dogs, stools, vases, etc., I may be able to make a surprisingly accurate estimate of its age, although this is often more difficult with grands of the 1900s. It would be nice to see the original receipts and warranties, because we learn a great deal from our collection of these, but many have been lost. In the past, some dealers were coy about revealing the true age of a reconditioned piano, and went to extraordinary lengths to paint over or deface date-marks. This is not only annoying, but quite unnecessary, because few people would be shocked to hear that a piano is 50 years old, and many are quite excited to discover that it is 100 years old. I often date pianos, but never had a full relationship with one, unlike some car owners. Dating pianos by their serial numbers is notoriously unreliable, partly because so much misleading information has been published. Date-marks are a much more accurate and reliable guide to the age of an instrument, but it is not always easy finding and interpreting date-marks inside pianos, and some instruments are just not marked at all. A notable exception is Erard, who marked the years on the actions of the London pianos, or the soundboards of the Paris pianos. Pape marked the year under the top of the strings but some, like one of ours, have unfortunately faded away. Wouldn’t you be tempted to think that this piano was made in 1755? In fact, it is about a century later. Serial numbers for most makers will go through a period when they are in four figures, and may resemble a year, for example, in 1791 Broadwood square pianos had serial numbers in the 1700s and 1800s. In 1789-1790, Erard numbers also resembled years, and around that time, Southwell’s numbers, displayed on the front of the piano, were slightly earlier than their years, such as #1784 in 1793. It is important to realise that pianos made after about 1810 are hardly ever marked on the outside with a straightforward year of manufacture, and if a year is written on a piano, it will often represent the date the firm was established, or the date of an exhibition medal. The following examples of possible date-marks are exceptions, possibly just coincidences of numbers, and certainly not normal key markings. 1892 Challen piano #21,300 is dated 10.92 on the keys, which are made by Lowe, and have a number which could be a date code - 13792. The date is also consistent with the published numbers for Challen. 1899? Craven & Co. piano #6,965, made around the turn of the century: The keys are marked 1899B. 1945 A key maker used the number 1945. …but something like A.D.1702 is much more tempting in an antique wood-framed piano, and one could be forgiven for imagining that the piano was made in Anno Domini 1702, whereas A.D. might stand for Andrew Dimoline, and 1702 would be just a number, NOT a year! (I suspect that Dimoline may have been enjoying a little joke here!) As iron frames improved towards the end of the 1800s, it became more common to cast various trademarks and other symbols into the frame. If your piano has an iron frame, these marks can often be found below keyboard level in an upright piano, and are quite easily accessible by removing the BOTTOM DOOR (the front panel below the keyboard). This is usually held in place by one or two simple clips at the top edge, unless someone has screwed it in. Grand frames are easier to see, but they rarely have straightforward date-marks. Registered Design Numbers such as 704198 often appear in uprights, but do not help us with dates. The whole concept of obtaining a single, precise date for an old piano is flawed, because the manufacturing process from components to completion was so long. Our files include original stock records for some retailers, and the following scenario is a realistic illustration of the kinds of problem that often occur when attempting to place a single date on a piano. 1900 The piano is designed, the iron frames are ordered in bulk, marked with the date they were cast. 1902 A patent is applied for, its number may have a suffix representing the last two digits of the year, such as /02. 1904 The action is manufactured, and stamped with the action makers’ number, which may be a useful clue. 1905 The keys are completed, and dated on a label. 1906 The piano is completed, already stamped with its serial number. 1908 The piano reaches the retailer, and the tuner dates his work. 1911 The piano is sold. What is the date of this piano? 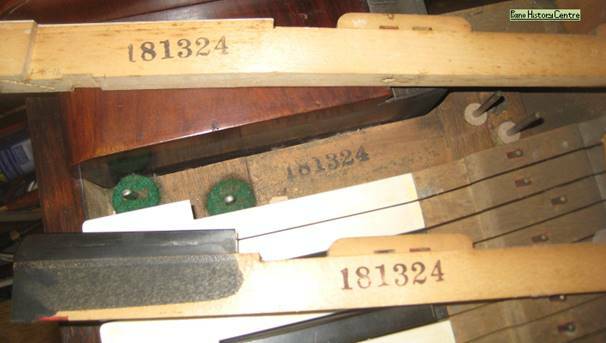 Because of these delays, it was not good business practise to mark the original date in any obvious place on the outside of a piano, so if you see a year on it, it is usually either the year the firm was established, (real or fictional) or a patent, or the date of an exhibition medal. Imprints will usually be from a factory or retailer, whereas hand-written information may not be reliable. By the mid-1800s, it was a common practise to date a piano on the side of the key of the bottom note with a pencil, as Ansell seems to have done in this example, but years with only two digits are always a little worrying, especially if they are done with a ball pen. Sometimes this dating occurred in the factory, or at the key makers’ premises, but on other occasions, an outside tuner often marked one or more dates when the piano was first tuned. Oddly, I have rarely seen examples where any 2 or all 3 of these apply to the same piano, but I recently came across one which has a date on the iron frame, and on the keys, and pencilled inside the case. Most often, the date is written on the side of the key of the bottom note as shown above. All of the cottage pianos shown here are dated on the side of the bottom key. In order to do some “piano archaeology” and dig around for these marks, you will need to undress an upright piano, but you don’t have to call in Time Team or use a JCB, and this is usually a very quick and easy process taking just a few minutes. Grands are more difficult, with more risk of damage, so it is wiser to ask your tuner to help. Occasionally, the date is on the second or third key, so it is worth checking a few if you feel confident about removing keys safely. Otherwise, ask your tuner to look. Broadwood uprights used to be dated on the side of the TOP key, as were some pianos by Robert Wornum, Henry Ward, and some German ones. 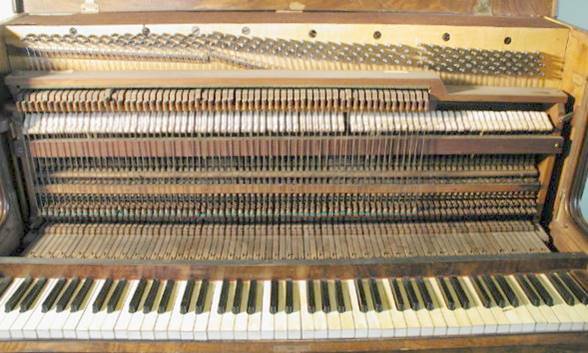 If you lift the top of an upright piano, you should see something like this, and the wrestpins (tuning pins) here are tapered to a square on their outer ends, like modern ones, but many antique pianos have the ends flattened to a crude oblong shape. Some ill-equipped tuners use this as an excuse to say the piano is no good, without even attempting to tune it. This is a failure of the tuner, not the instrument. Imagine if you took your car to a garage to be repaired, and they wanted to scrap it because they didn’t have the right size of spanner! Although it is fair to say that many pianos become untuneable after 50 or 60 years, oblong pins do not necessarily mean that a piano is untuneable, our 1879 Challenger certainly challenges this idea, with oblong pins that are STILL tighter than some brand new pianos after 140 years. 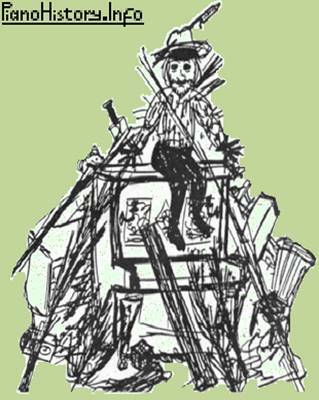 In the picture above, there is no sign of an iron frame, so this suggests that it may be a purely wooden structure, although sometimes, the iron frame does not extend right to the top, it may be what is known as a THREE-QUARTER frame. There may be a brass covering, or the wood may be painted gold by cheap repairers, but when in doubt, a magnet will tell you which bits are made of iron, although ironwork is more obvious below keyboard level, and usually painted black or gold. It has been suggested that a brass covering was intended to protect the piano from extreme climates, if it did not have a full iron frame. In the early years, tuning was not necessarily done by professionals, and it was helpful to amateurs to mark the names of the notes against the wrestpins. Professional tuners have no need for this, they can see which notes they are tuning, and simply follow the relationships between notes, rather than their individual identities. All notes are treated equally, so the practice of marking the notes died out in the late 1800s, because as pianos improved, and tensions increased, piano tuning became almost impossible for amateurs. If you have ever had trouble tuning a 6-string guitar, a 12-string is much more of a problem, so imagine what it would be like to manage 35 times as many strings, 12 times the tension on each string, and a much less user-friendly tuning system. Tuning a piano in an hour is a lot harder than you might think! Have a look at the steel wire used for the strings. Within a very few years of being made, the wire will often change from a silvery grey colour to almost black, this is normal. If the wire has a green tinge, this is associated with being in a room with a gas fire, but doesn’t seem to indicate anything important. However, if the strings, or the tuning pins to which they are attached, are going rusty, this needs to be treated. The whole subject of “oiling pianos” is a minefield, and there is a lot of paranoia in the British trade because of a man who was shown on television pouring oil all over the inside, and letting it drip onto the floor, although bridge lubrication is widely accepted in America. My advice, though considered controversial among British tuners, is to spray the wrestpins and top bridge with WD40: I have been doing it since the seventies, it does nothing but good. In case you are wondering, you couldn’t lubricate the tuning pins and make them looser in the wood, even if you wanted to. I have done extensive tests. The TOP DOOR (top front panel) of an upright piano is usually held in place by two simple clips at the top corners, accessed by simply lifting the top. Then, the top door can be tilted forward and lifted out. 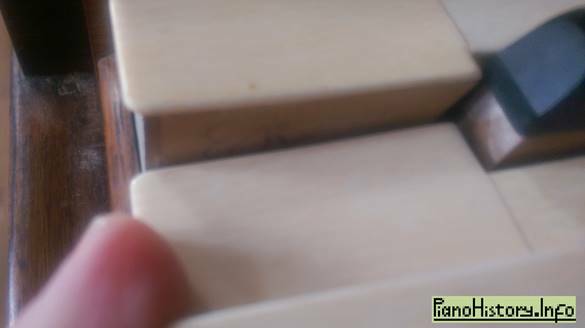 The FALL (keyboard lid) is hinged to the HOLLOW, and this is usually just slotted in, so in theory it can be lifted out vertically with one hand on the fall. In practise, old pianos often warp, and if the hollow hasn’t been removed for years, it might be so tight that you need a carpenter’s help to get it back. Some hollows are much simpler, and held in place by a screw each end. There may also be a strip of wood called a NAME-BOARD holding the keys in place, this may be screwed or clipped in at the ends. (Name-boards don’t usually have makers’ names on them, although retailers often mark them with a transfer or label.) Now, you should be able to see the whole length of each key, and it is usually possible to carefully lift out individual keys to examine all their surfaces for interesting marks. However, before you do this, have a good look at the dust. If only the middle of the keyboard has been used, the dust there will have fallen off the edges of the keys, leaving ridges along the middle of each key, and you may be able to see what area of the keyboard has been used regularly, or whether there have been favourite notes. Is it ordinary grey dust, or does it have leather and felt colours? These would suggest heavy use and wear, which may lead to repair work being required, to fix unevenness in the performance of the notes. Before you start removing keys, have a look at the TOUCH DEPTH – the distance that the keys go down before they stop. As the felts and baizes under the keys wear and compress, they become thinner, and unless the keys are moving the correct distance, the action cannot perform efficiently, so the notes will not play correctly. Instead of measuring, press a black note all the way down until it stops, and check that the nearest end is still a couple of millimetres above the surrounding white keys, and doesn’t disappear down a hole. Then press the white keys either side of it down as well, they should now be in the same relationship that they have when at rest. If this is not right, there is probably wear and/or deterioration in the felts and baizes under the keys, so they need to be replaced. Repeat the test in different parts of the keyboard. The keys are usually numbered left to right, other numbers marked on keys would obviously have meant something to the makers originally, but generally speaking, no information has survived to help us interpret them, and they rarely relate to the piano’s serial number, although this unusual example from around the 1914 war has Collard’s serial number rubber-stamped on two keys and on the key-frame. (They were making their own actions and keys then.) I suggest laying out the keys in order on top of the piano. Before you start doing this, it is vital to remember that every key is slightly different, and if they are not clearly numbered left to right, you must mark them in some way, so that they do not get mixed up. You can number them individually in pencil, but a simpler idea is to use some kind of straight edge to draw a sloping pencil line across the wooden tops of the keys. While you are removing them, you have a rare opportunity to remove loose dirt, and wet wipes are quite good for this job. Major cleaning of every wooden part is risky, and may cause damage, so leave that to an expert. Inspect every surface of the key for dates or names. The action (the working parts of the notes) is more risky to remove, as you may well break parts, or not be able to get it back, and it is wiser, especially with grands, to get your tuner to look for marks. Actions are not usually dated, just numbered, and sometimes marked with the name of the action maker. In old German pianos especially, the action makers’ name and number may be your best clue to the date. On our Numbers page, there is a summary giving dates of many of these action numbers, and this can be a useful guide when nothing is known about the piano maker, or there is no name on the piano. Some modern Japanese uprights have a number on top of the main action rail, near the treble end, and the first two digits may indicate the year. In a modern piano, the 2 holes in the key that fit over the metal pins would be bushed with felt or cloth, to provide a smooth, silent bearing surface, and such keys would be described as DOUBLE-BUSHED. Victorian keys tend to have neither of these bushings, they are usually UNBUSHED, and may rattle or stick. Somewhere between the two, some old pianos have keys that are SINGLE-BUSHED, in the front hole only. Double-bushed keys are probably after 1870, single-bushed keys are probably before 1920. Remember, any object you find in there may be dated, but that does not prove the date of the piano (as it claims to in archaeological digs) because, for example, an 1870 coin could have been placed there at any time after 1869. Hand-written labels in pianos are sometimes faked, and are not reliable, but some piano owners don’t like being told that! The keyboards are usually made by a separate firm, and may have a label under the bottom key, like the following examples. Some key-makers stamped their name into the key-frame under the keys, in one or more places, and the exact wording of that name may also give us some clue to the date range. By the 1900s, some key makers used paper labels. This key-frame label, photographed by Richard Harrison, shows the date of Cramer piano #36771 as 1904, confirming the published information. This key-frame label from a 1938 Bansall piano is marked CELL, meaning that the key coverings are made of celluloid. Size 9.9 x 6.3 DB. DB means double-bushed. This key-frame label from a Challen School Model, also marked LCC (London County Council) confirms the date of the serial number 56353 as 1935. 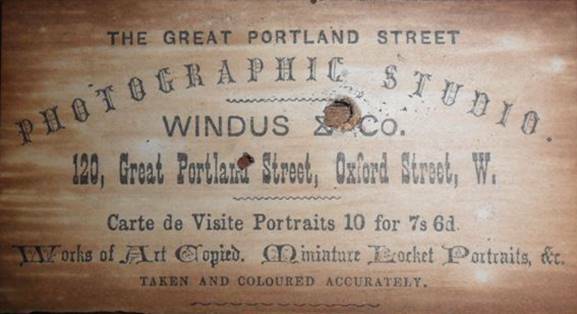 This card shows that as well as making pianos, Windus & Co. had a photographic studio in Great Portland Street. Around the 1880s, pianos and organs were “specially manufactured” for John Bridges, and we have one of these pianos. A distant relative emailed me to say that unless someone could take her John Bridges piano, it would be going on the bonfire. I replied “Don’t burn your Bridges!”. The John Bridges card above was used as key-frame packing inside one of Alfred Bridges’ pianos, so it seems likely there was a family connection. One piano had suffered a nasty infestation of CAVIAR, presumably tipped in there by someone who couldn’t face eating it. Other items I have found inside pianos sadly didn’t include a hoard of gold coins, but there were apple cores, badges, batteries, beer, beer mats, bike pump, bike clips, bird seed, bottle-tops, buckle, bus tickets, buttons, candlewax, chalk, cheese, chess pieces, Christmas-tree spines, cigarette ash, cigarette cards, cigarette packet, clothes pegs, condoms, conductor's baton, corks, cutlery, documents, drawing pins, gold locket & chain, Green Shield stamps, guitar plectra, hairclips, hymn lists, ice-cream, jewellery, jigsaw pieces, laundry ticket, lego, lolly-sticks, miniature playing cards, moths, necklace, needle threaders, needles, paper clips, pencils, pens, photos, pins, plant buds, pocket watch, polling card, postage stamps, postcards, quill pen, raffle tickets, Royal Tournament programme, rubbers, sheet music, silver spoons, spanner, spiders, sweets, table tennis balls, ticket for Tower of London, tiddlywinks, toothbrush, tote numbers, toys, wrapped cigar, and also (in one piano) 23 drinking straws, the removal of which considerably improved the performance of the instrument! I also found a five-pound note, and that started a terrible family argument, not because anyone claimed it, but because they were all denying losing it. If I had put it in my pocket, nobody would have known! Many tuners write the date of tuning on the top or side of a key, or perhaps on the action if it has a wooden top. Traditionally, the warranty on most pianos would require them to be tuned 3 or 4 times in the first year, and some dealers would pay for the tuning for a year, so the original tuner might mark each of these visits, and such a bunching of dates is often a clue to the year of manufacture, but for example, a Broadwood made in 1842 had tuning dates starting at 1873, so it doesn't always work. Beware of years shortened to 2 figures, because they don't specify the century, so the mark may be more modern than it seems, especially if it is written with a ball pen. Most piano firms employed separate iron foundries to cast their frames, so the marks will often indicate the name or trademark of the foundry (such as a Crown, Flags, Harp, or Jug/Pitcher) rather than the piano firm. (The Crown foundry was established in Northampton around 1907 but not every crown mark is theirs.) Similarly, if date-marks are found, they tend to indicate the date the frame was cast, rather than the date when the piano was completed, and since some models would be ordered in bulk, there could sometimes be a delay of as much as 5 or 6 years before the piano was completed. However, the casting date does tell us that the design existed in that year. Kelly frames (U.S.A.) encode the year by counting from the year they were established, 1905, so add 5 to the year. Similarly, for Wickham frames, add 15 to the year. Some frame marks are thinly disguised by turning them upside down, or substituting roman numerals for the month, which may indicate German origin. With any form of abbreviation, there is always room for misinterpretation, for example frames marked C&S in a triangle have no known connection with Crane & Sons, and may refer to Clarke & Son. Surprisingly, the German makers, who often included such intricate decorative detail in their castings, and painted decoration, rarely provided straightforward date-marks on the frames, although some marks may give vague clues to the age of a piano. Your best chance with an old German piano is that the action makers’ name and number may be marked on the back of the action. Around the 1870s, Challen & Hodgson marked a handwritten date on a stout wooden post inside the bottom of the piano, an unusual location, but done in the factory before the piano was completed. This means that Challen & Hodgson pianos provide us with useful evidence of dates of numbers, which can help not only with other Challen pianos, but also with estimates of dates for other makes. There are often many outward signs of a period in antique pianos, but by the 1920s, it becomes harder to find any definite clues to the age of a piano, because by then, the designs had become much more standardised, especially in grands. Without donations, I will be fine, but our collection may not survive. If every visitor to this site made a donation, it would help us with displays in our museum building, and with much-improved facilities for research within our own archives.